The 2007 Cadillac Escalade rolls down streets with a little more conviction after upgrading its powerful V8 engine to 6.2 L and 403 hp with 6 speed automatic transmission. In addition, Cadillac re-did the exterior and strengthened the frame for the most famous SUV in hiphop. Improved steering and 22 inch wheels add style and substance to this powerful vehicle. The 2007 Escalade comes in 2 trims: AWD and 2WD. Gas consumption runs from 13 mpg in the city to 20 mpg on the highway. This luxury SUV has 4 doors and 3 rows of seats that can hold up to 8 people. Standard features include power windows, power door locks, leather seats, power seats, cd player, ABS brakes, traction control, and stability control. Sunroof and navigation system come as options. The Escalade goes from 0-60 mph in a shade over 7 seconds. As for trunk space, the 2WD gives you 16.3 cubic feet and the AWD gives you 16.9. Everyone loves the power and performance that the Escalade provides. However, drivers would appreciate better fuel consumption and easier access to the third row of seats. In any event, bring your checkbook and your conviction when you head to the dealership. The '07 Escalade understands its identity and makes no apologies. What's your take on the 2007 Cadillac Escalade? 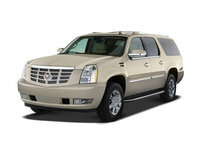 Users ranked 2007 Cadillac Escalade against other cars which they drove/owned. Each ranking was based on 9 categories. Here is the summary of top rankings. 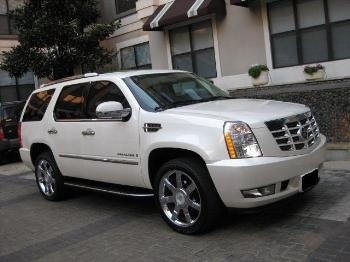 Have you driven a 2007 Cadillac Escalade?